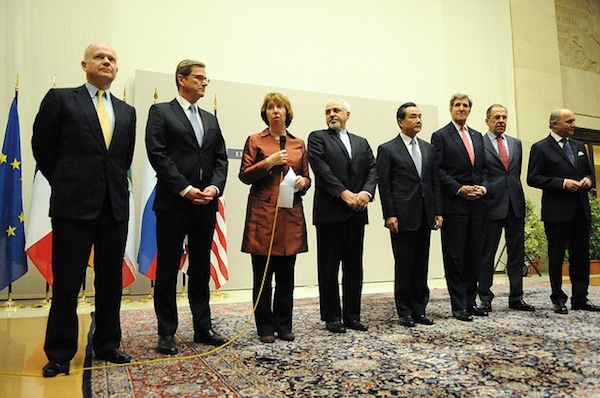 GENEVA, Nov 24 2013 (IPS) - A momentous agreement over Iran’s nuclear programme was officially announced shortly before 3:00 am local time via Twitter by the spokesperson for EU foreign policy chief Catherine Ashton, Michael Mann, on Nov. 24, after more than four days of grueling talks. The deal occurred after years of negotiations with Iran but only three and a half months after the inauguration of Iran’s moderate president, Hassan Rouhani, who has already overseen several historic foreign policy milestones. “We just finished many days of hard work,” said Iran’s lead negotiator, Mohammad Javad Zarif, at the night’s first press conference shortly after signing a four-page agreement with his P5+1 (the United States, Britain, France, Russia, China plus Germany) counterparts at the Palais des Nations. “Now we are in the process of moving forward the resolution based on mutual respect and equal footing,” the veteran diplomat, who has enjoyed consistent support from Iranians and Iran’s Supreme Leader Ali Khamenei since talks resumed in October, added. “While today’s announcement is just a first step, it achieves a great deal,” U.S. President Barack Obama said in a late-night statement from the White House. In Geneva, U.S. Secretary of State John Kerry praised Zarif’s role in the talks and Tehran’s decision to “come to the table”, which he credited to the very sanctions Iran has vehemently dismissed as a motivator. He emphasised to reporters that the first-step agreement aimed at reaching a final, comprehensive solution includes significant limits on Iran’s nuclear programme and addresses the international community’s concerns. “All sides would gain [from this deal], except those few who believe that it’s feasible to expect that Iran could be sanctioned enough to give up enrichment entirely,” George Perkovich, a nuclear non-proliferation and strategy expert focused on Iran at the Carnegie Endowment for International Peace, told IPS. Under the six-month phase of the deal, Iran is expected to halt uranium enrichment above five percent; convert its existing stockpile of 20-percent-enriched uranium to fuel for its Tehran Research Reactor or dilute it to five percent grade; halt “further advances of its activities” at its Natanz and Fordow Fuel Enrichment facilities and at its Arak reactor; and implement further, advanced monitoring by the International Atomic Energy Agency (IAEA). In return Iran will gain approximately 7 billion dollars of sanctions relief; Iran will be given relief from U.S. sanctions on its auto industry as well as spare parts and repairs for its aviation industry; no further U.N., EU or U.S. nuclear sanctions will be issued; and a channel will be established to better facilitate humanitarian trade. Like many other Iranians, Maryam Askari, a 38-year-old Tehran-based researcher, stayed awake as long as she could to hear news of the negotiation results. “Many people are doing the same, even housewives – even a servant in my friend’s house asked her about the results of the negotiations,” Askari told IPS shortly before the deal was announced. Askari added that she wants a deal that eases tensions with Western countries, reduces pressure on Iran’s dilapidated economy and recognises what she considers Iran’s right to peacefully enrich uranium as a signatory to the Nuclear Non-Proliferation Treaty (NPT). “I am looking for a fair deal,” said Askari. But what Iran considers its “inalienable right” to enrich uranium – something it has been emphasising for years – was addressed differently by U.S. and Iranian representatives here. But Kerry reiterated that the United States does not recognise any country’s right to uranium enrichment. “This first step…does not say that Iran has a right to enrichment, no matter what interpretation the prime minister made, it is not in this document and there is no right to enrich within the four corners of the NPT,” responded Kerry. “We can expect a strong amount of pushback from critics in the U.S. and Israel, and we’ll have to see how hardliners in Iran react,” Alireza Nader, an international policy analyst at the RAND Corporation, told IPS. Although Kerry stressed that this agreement will bring security to the region and make U.S. ally Israel “safer”, Israeli Prime Minister Bibi Netanyahu today called the deal reached in Geneva “a historic mistake”. Key members of U.S. Congress also criticised the deal shortly after it was announced. “Unless the agreement requires dismantling of the Iranian centrifuges, we really haven’t gained anything,” tweeted the hawkish Republican Senator Lindsay Graham, who features in media coverage of U.S. foreign policy debates. “You’re going to see a bipartisan effort that enrichment is not in the final agreement,” predicted Senator Bob Corker, the ranking Republican on the Senate Foreign Relations Committee, on Fox News Sunday. In his speech, Kerry said he looked forward to working with Congress in upcoming discussions over the deal but also acknowledged a presidential “possibility of a veto” in an apparent reference to Congress trying to pass more sanctions on Iran during this phase of the deal. Iran’s team, at least, has returned to much praise from Iranians, who through interviews with IPS and various illegal social media in Iran have been expressing joy since news of the deal broke. Iran’s Supreme Leader Ali Khamenei also expressed his blessing through a tweet and a letter addressed to President Rouhani. “The content of the agreement will be closely examined, but generally speaking, the mere fact of an agreement has lead to a sigh of relief for most Iranians,” Farideh Farhi, an independent scholar at the University of Hawaii who has been in Iran for the last several months, told IPS. “It signals a desire for de-escalation from all sides, away from a troubling dynamic that many feared would not only mean more economic hardship but also eventually war,” she said. Within the four corners of the Affordable Care Act, you can keep your health plan if you want to, yet where are we now ?